The New Chevron Series was a redesign and continuation of the Chevron Books series. Both were paperback series meant to compete with Penguin. 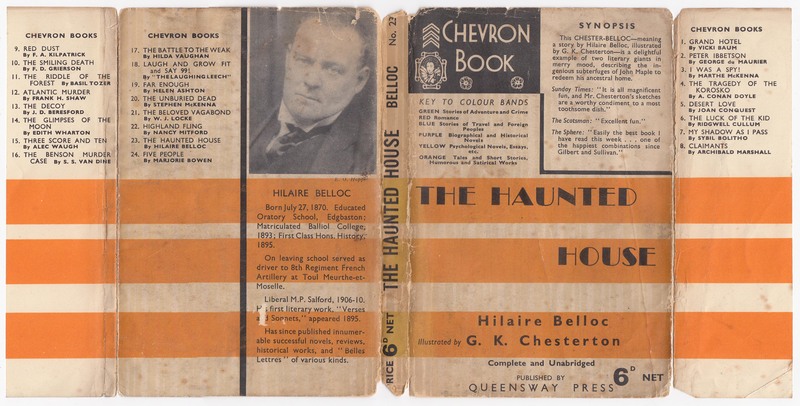 These series were the final output of the Readers Library Publishing Co. Ltd. (and its imprint Queensway Press). 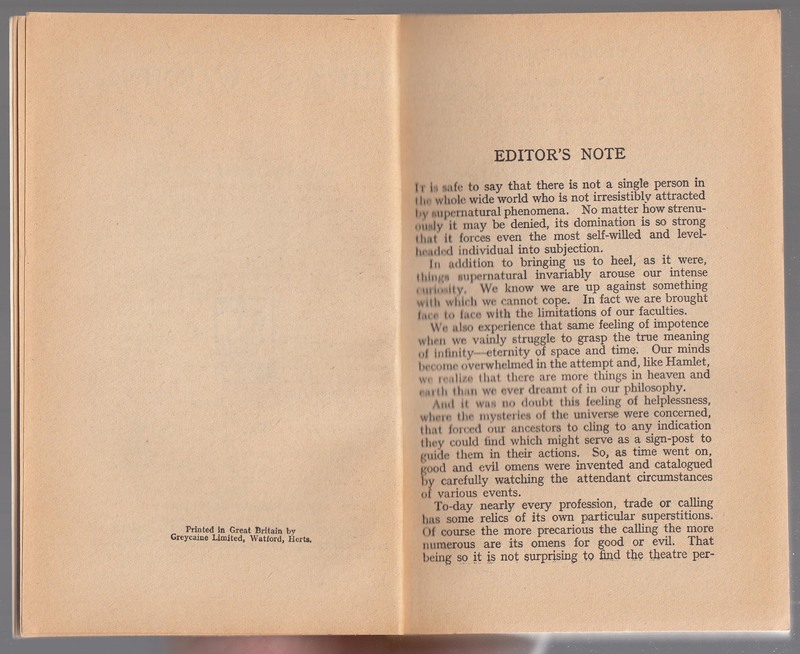 The Readers Library was one of the dominant cheap hardcover reprint series of the late 1920s and early 1930s. Indeed, when Allen Lane (who started Penguin Books) contacted Woolworths about stocking Penguin Books, Woolworth’s buyer said that “Readers Library is a better value. (“The Penguin Story: Sir Allen Lane’s 50 years,” The Times (London), 22 April 1969). By the mid-1930s the Readers Library series was greatly diminished, and the focus shifted to a paperback series to compete with Penguin Books. 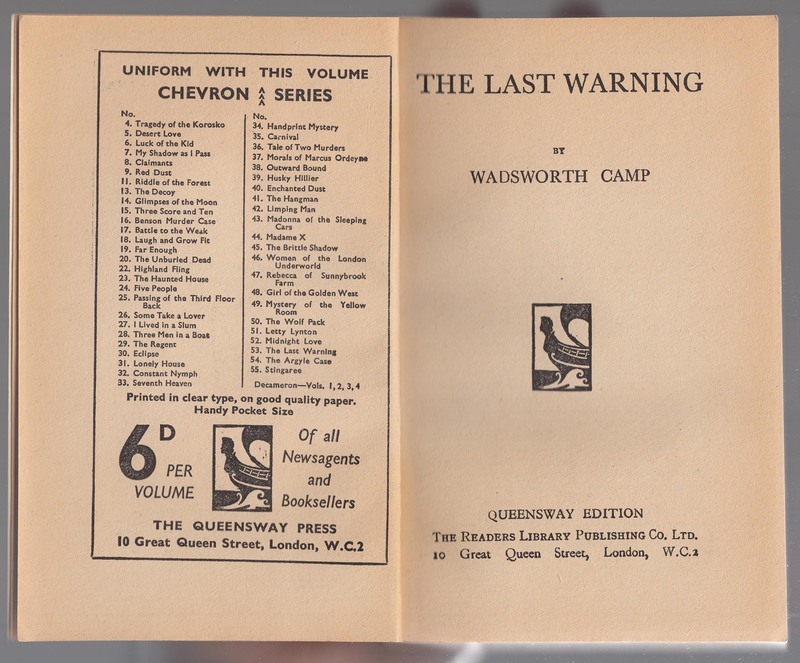 The initial Chevron Books series were a bit odd: squat – due to the width – and with a jarring jacket design that consisted of a rather unholy alliance of Penguin-inspired modern geometric design with a barrage of text. 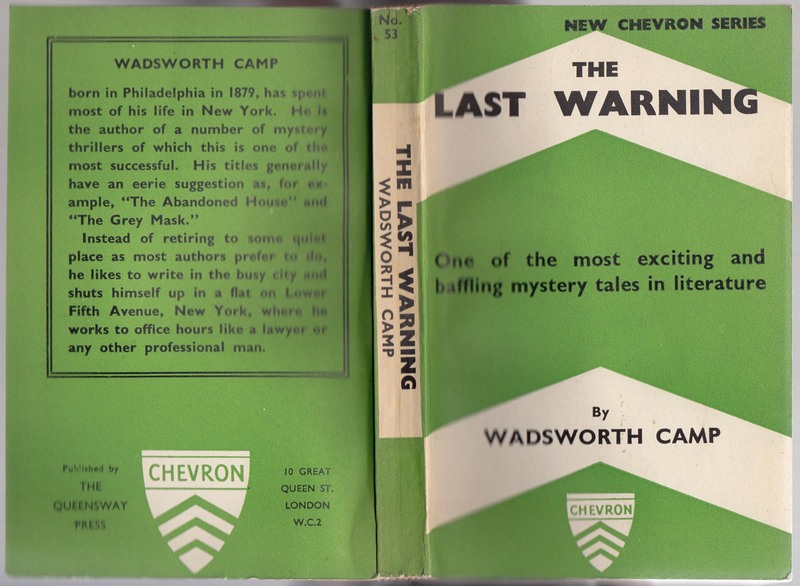 After 30 titles issued under the Chevron Books name (in 1936 and 1937), the series was redesigned, narrowed by .25 inch, with a modified series name (New Chevron Series) but continuing the series numbering (with #31). This transformation roughly corresponds to the firm entering receivership (in 1938). The Queensway imprint is sometimes used, but the Readers Library Publishing Co. imprint is more common. The book below has Readers Library as the publisher but includes “Queensway Edition” above the imprint. The series continued at least to #114, Wallace Ellison, Escapes and Adventures, An Abridgement, issued in 1941. 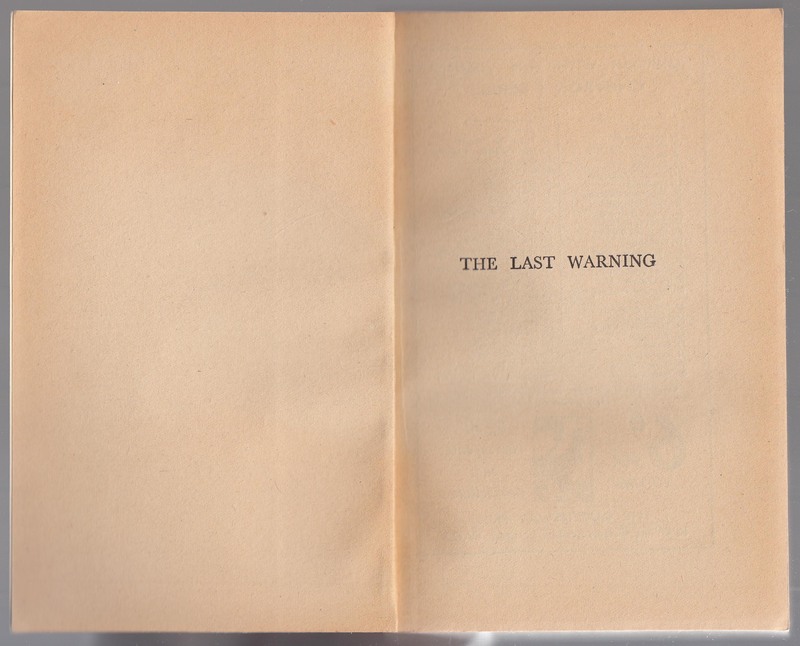 I think this was the last title, although it was, it seems, also issued as #84, in unabridged form in 1939 (253 pages as opposed to 192 pages in the abridged version). I can’t find any titles issued under five late serial numbers (#103, #104, #106, #107, #113). Many of the New Chevron Series titles were issued earlier in the Readers Library. So the New Chevron Series is a reprint series drawing from an earlier reprint series. More information can be found at the Readers Library and Chevron Books pages. 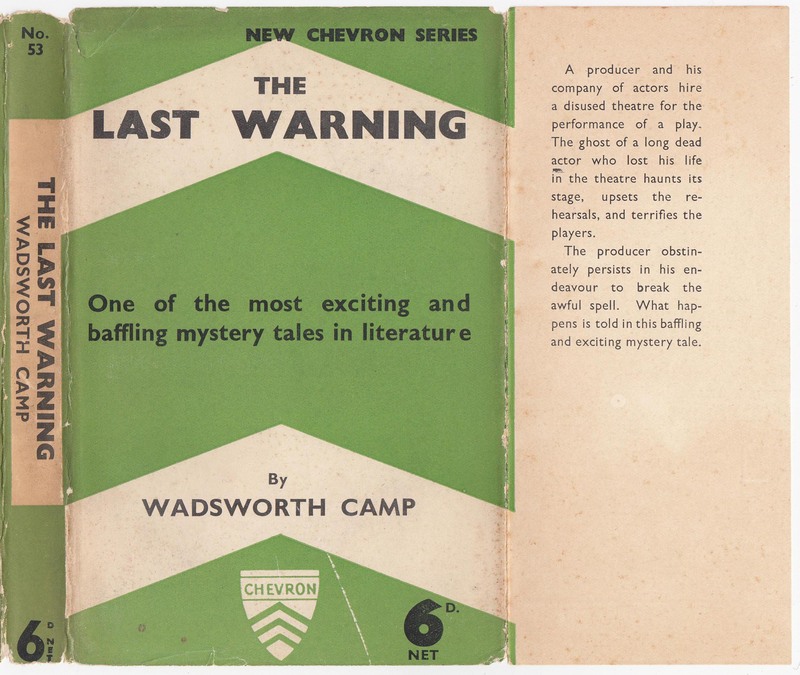 The book below is Wadsworth Camp’s mystery The Last Warning published as #53 in the series in 1938. The new design, drawing inspiration from the series name (a chevron design) is much cleaner and coherent than the earlier jackets. The jacket design is common to the series, with the color varying to match the series categories (green titles are “stories of adventures and crime”). Other categories include red (romance), blue (stories of travel and foreign peoples), purple (biographical and historical novels), yellow (psychological novels, essays, etc.) and orange (tales and short stories, humourous and satirical works). The series number is on the spine as is the 6p. price. The series name is at the top of the front of the jacket and the price is also on the jacket front. A synopsis of the book is included on the front jacket flap. 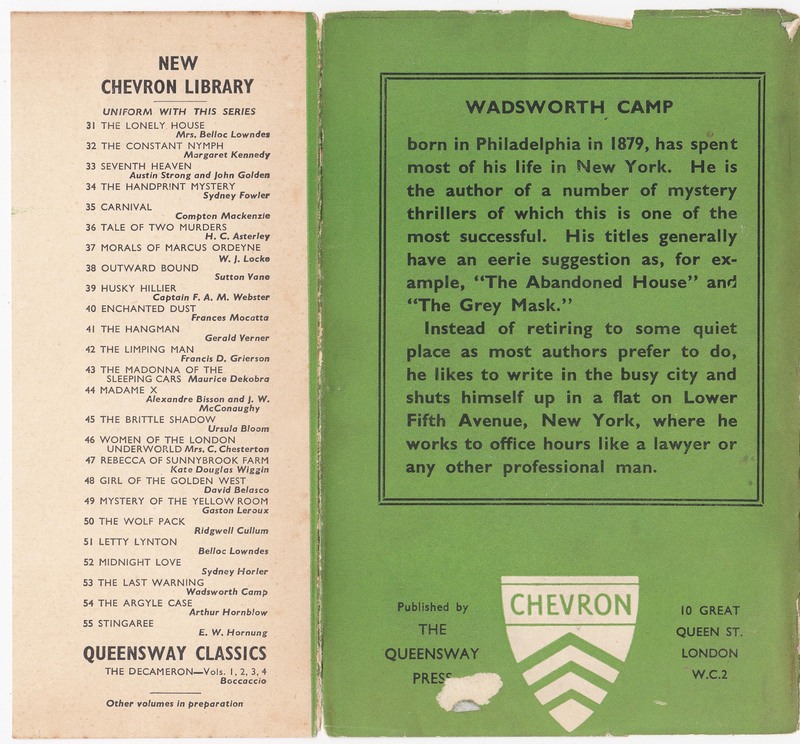 The rear of the jacket provides a biography of author Wadsworth Camp. The Queensway Press and its address (10 Great Queen St, London) is included as well as the series colophon. The rear jacket flap seems to contain an error: the series is called the New Chevron Library (instead of Series). Titles from #31 (the first in the new format and under the new series name) through 55 are listed. The four Boccaccio titles in the Queensway Classics are also listed. The paper covers of the book replicate the jacket content, except for the price. An advertisement for the series faces the title page. The series name is correct here (compared to on the rear jacket flap). However, unlike the rear jacket flap, this list of titles includes many that were issued prior to #30 under the previous Chevron Books series name and format. This suggests that many of the Chevron Books titles were reissued in the New Chevron Series format. Missing from the list are #1, #2, #3, #10, #12, and #21. A list of books published in the New Chevron Series is below. This is a modified version of the list at Brass Penguin. I added full author names and the year of publication and fixed some typos. All but six (#1, #2, #3, #10, #12, and #21) of the initial 30 Chevron Books titles seem to have been reissued in the New Chevron Series. Titles prior to #31 are listed on the Chevron Books page. Two additional titles under the Readers Library imprint appear in 1942 before the imprint disappears. I don’t know if these titles were in the New Chevron Series or not.